Internal migration has always been a part of America. The ability to move for a better job has promoted economic growth. AIER studies have shown that a better match between workers and employers helps productivity and wages. A new article from the Mises Institute shows that Americans are also moving for favorable tax environments. For example, retirees move to Florida because it lacks a state income tax. People leave New York State because of high property taxes. Businesses leave California for Texas because of lower income taxes. New York, California, and Illinois saw the largest number of people leave in 2015. New York State saw 191,000 residents move to other states in 2015, while California lost 129,000 and Illinois lost 128,000. According to the Tax Foundation, New York has the highest state and local tax burden as a share of personal income at 12.7 percent. California and Illinois are not far behind. Both California and Illinois have a state and local tax burden of 11 percent of income. Where are these people moving? People from New York, California, and Illinois are headed to places such as Colorado and North Carolina. In 2015, Californians made up the largest share of new arrivals to Colorado at 12.8 percent. People from Illinois made up 5 percent of new arrivals to Colorado. Colorado has the 35th-lowest state and local tax burden as a share of personal income. New Yorkers are headed to North Carolina. In 2015, New Yorkers made up the largest share of new arrivals to North Carolina: 7.5 percent. North Carolina has the 20th-lowest state and local income tax burden. Burdensome regulatory policy and a lack of personal freedom also push people out of states such as New York, California, and Illinois. Each year, the Cato Institute creates the Freedom in the 50 States Index. The index includes state regulatory policies, personal freedom, and fiscal policies. Included regulatory policies concern such issue areas as health insurance, occupational restrictions, and land use. Personal freedom concerns marriage, education, and the criminal justice system. Last year, New York State was ranked 50th, or dead last, on the Freedom in the 50 States Index. California was right behind New York State at 49th. Illinois fared slightly better at 44th. What does this mean for high-tax states with burdensome regulations? 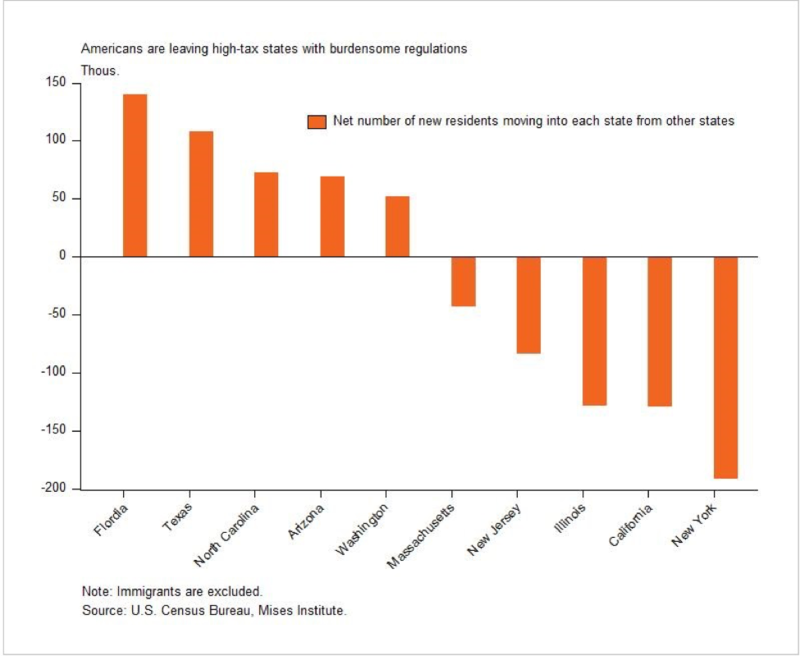 High-tax states are losing human capital and financial wealth to low-tax states with more personal and regulatory freedom. When people leave high-tax states, it tends to reduce business formation, job creation, and consumption in those states. This means a smaller tax base to support high government spending. High-tax states need to cut spending, lower taxes, and foster a friendly regulatory environment if they want to keep their residents. California and Illinois also need to address their unfunded state pension liabilities. AIER pointed out in a recent post that unfunded state pension liabilities mean even higher taxes on the horizon.